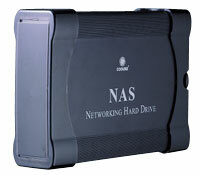 The CN-590 is designed to suit SATA I/II HDD up to 2 TB! It allows you to share among different users within your network conveniently and securely, even if you have different operating systems - Windows, Mac or Linux! Don't be vulnerable to external predators, this network enclosure is also conveniently password protected, so your account will be safe, and your shared data will remain exclusive. This enclosure is also built with full aluminum chassis and fan for top heat dissipation! In addition, you also won't need drivers or servers! It's easy. It's safe. It's our CN-590 external network enclosure.